Fiji, officially the Republic of Fiji, is an island nation in Melanesia in the South Pacific Ocean about 2,000 km northeast of New Zealand's North Island. It is surrounded by Tuvalu to the north, the Samoas, Wallis and Futuna to the northeast Tonga to the east, New Zealand's Kermadec to the southeast, France's New Caledonia to the southwest and Vanuatu to the west. Fiji is comprised of a group of volcanic islands in the South Pacific lying about 4,450 km. southwest of Honolulu and 1,770 km. north of New Zealand. 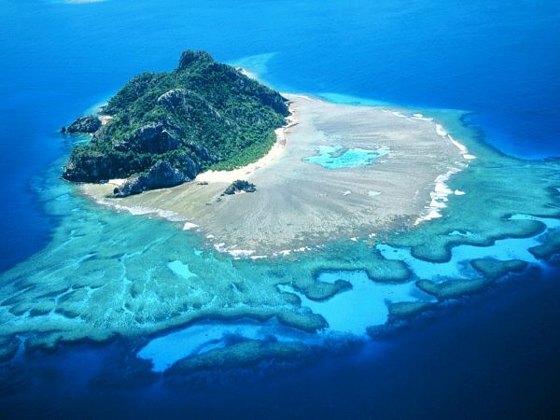 Fiji’s islands were formed through volcanic activity 150 million years ago and vary dramatically in size. Fiji comprises an archipelago of more than 332 islands, 110 permanently inhabited, and more than 500 islets, for a total land area of approximately 18,300 square kilometres. 87% of the population of about 855,000 people lives in the two major islands, Viti Levu and Vanua Levu. Suva, located in Viti Levu, is the capital and largest city. 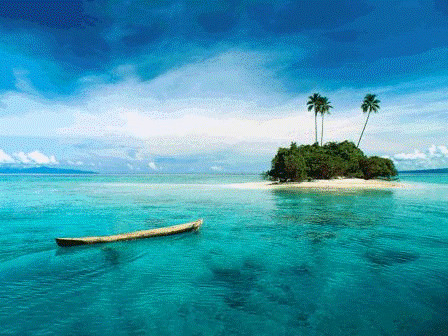 Most of Fijians live on its coasts. Fiji was a British colony until 1970. Its natural resources include timber, fish, gold, copper, offshore oil and hydropower. Because of the abundance of forest, mineral, and fish resources, Fiji is one of the most developed economies among these islands. Nowadays its main sources of foreign exchange are its tourist industry and sugar exports. Fiji has a significant amount of tourism and Australia, New Zealand and the USA are among the biggest sources of international visitors. 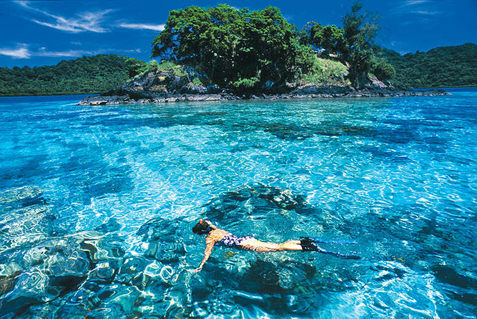 Fiji has a significant amount of soft coral reefs, and scuba diving is a common tourist activity. Regarding transportation, the Nadi International Airport is located 9 km north of central Nadi and is the largest Fijian centre. Nausori International Airport is about 23 kilometres northeast of downtown Suva. Fiji's larger islands have extensive bus routes that are affordable and consistent in service. When it comes to religion, Indigenous Fijians are mostly Christian and the Indo-Fijians are mostly Hindu and Muslim. Christian 64.5% ( Methodist 34.6%, Roman Catholic 9.1%, Assembly of God 5.7%, Seventh Day Adventist 3.9%, Anglican 0.8%, other 10.4%), Hindu 27.9%, Muslim 6.3%, Sikh 0.3%, others 0.3%, none 0.7% ( According to 2007 census). Fiji's culture is a result of a rich mixture of indigenous, Indian, Chinese and European traditions that influence all aspects of the society: language, food (based mainly on fish and seafood, cassava, and vegetables), costume, beliefs, architecture, arts, craft, music, dance and sports. Rugby and football are popular sports among the Fijian community. The indigenous culture is present in everyday life and is part of Fiji’s national identity. World known for its natural beauty and marvellous beaches, amazing blue waters and ideal tropical climate, Fiji has everything you need. Water sports, excursions, relaxation and adventure: here you will find good beaches where the underwater scenery is spectacular as well as lots of resorts, eco-parks, waterfalls, rain forests and an inland tour local that includes a visit to the Garden of the Sleeping Giant, the largest orchid collection in the South Pacific. These are only some of the entertainment options you will find in this fabulous place. Its ideal landscapes, well appointed resorts and lots of entertainment options make Fiji the perfect setting for a unique romantic wedding and honeymoon. When considering things to do in Fiji you will be astonished due to all possible activities, excursions and sports you can enjoy here. Temperature 22 - 30°C (72 - 86°F).